READ: Bee Poisoning: Ban Neonicotinoids, Save Bees! Over the past decade populations of honey bees and other pollinators have been in decline worldwide. This phenomenon, often referred to in media as Colony Collapse Disorder (CCD), is characterized by a rapid loss of a colony’s adult worker bee population, and has been associated with Varroa mites, viruses, environmental stress, and pesticides. Reports of the ‘mysterious disappearance of bees’ abound in scholarly studies and the media, along with disclaimers that no causal effect has been proven. An article entitled “Existing Scientific Evidence of the Effects of Neonicotinoid Pesticides on Bees“, which appeared in an online European Parliament publication (EAA, 2012), describes a causal effect – bee poisoning by neonicotinoid pesticides. Mounting undeniable scientific evidence has surfaced from around the globe linking neonicotinoid pesticides to mass bee deaths. In order to protect honey bees, various member states of the European Union have taken regulatory action on the use of specific neonicotinoids. The European Parliament report describes that “neonicotinoids block an intrinsic chemical pathway which transmits nerve impulses to the insect central nervous system” causing irreversible and cumulative damage to the central nervous system and death. Bees exposed to neonicotinoids exhibit convulsions, tremors, and uncoordinated movements typical of exposure to neurotoxins. Neonicotinoids are systemic pesticides that are absorbed into plant tissues. The poisons are highly soluble in water and are applied to a variety of agricultural crops with sprays, seed coatings, soil drenchers and granules, injections into tree trunks, or as an additive to irrigation water. Neonicotinoids migrate through soil and the entire plant all the way to the flowers. This causes toxic, lethal, and chronic exposure to non-target species including earthworms, birds, fish, and pollinators (Mason, et al., 2012). Additional exposure routes also exist depending on the method of application. Neonicotinoids are able to remain in the plant tissues for months to several years. Representing the main Big Ag neonicotinoid pesticide producers, CropLife Canada, maintains that its lucrative neonicotinoid business should not be held responsible and accountable for any honey bee colony declines and instead insists that Varroa mites are primarily to blame (Hepworth, 2013). Beekeepers monitored their affected hives throughout the season and reported on the ongoing effects. These included lack of recovery, dwindling colonies, and lack of honey production. Prior to their exposure the bees were healthy. Our research apiary is located in a semi-agricultural area with large stretches of forests and scattered residential homes. To the East is grazing land and an estimated 100 acres of cultivated land. In 2010 and 2011 this field was planted with corn and in 2012 it was planted with soy. In early May of 2010 we observed several hundred dying and dead bees on the ground in front of some of the colonies. They displayed the typical signs of insecticide poisoning; many were dead while others were on their backs with their legs twitching and proboscis extended. By late July, six colonies displayed dying brood and dwindling population, both signs of colony collapse disorder. Since 1992 we have kept four hives on scales so that their weight changes could be measured daily in the summer and weekly in the winter. Also since 1992 we have been closely monitoring Varroa mite populations (Szabo 1993, 1994, 1995, 1998, 1999, Szabo & Szabo, 2000, 2001, 2002, 2003). During the first 18 years (1992-2010), from a total of 72 different colonies in the four scale hives, only one colony had died. Then, during the winter of 2010-2011 all four scale colonies died. From the other 51 colonies in the same bee yard 31 (61%) died. In the winter of 2011-2012, 10 (33%) of the 30 colonies and two of the four scale colonies died. In early May of 2012 we found hundreds of dead bees in front of four hives. In order to replace the losses 11 new colonies were made up. By October 2012, only 19 of 31 colonies had survived and were prepared for wintering. The collapse of colonies continues to the present. In early May 2012, old partly decomposed dead bee samples were collected from the front entrances of four colonies and blooming dandelion flowers were collected from the bee yard and ditch near a treated soybean field that had been planted with treated corn in 2010 and 2011. Neonicotinoids in these samples were not detected at the reporting limit of 0.005 ppm for Imidacloprid and Thiamethoxam and 0.001 ppm for Clothianidin. Health Canada Pest Management Regulatory Agency (PMRA) personnel did not collect fresh samples from dying colonies or soil and water samples from the field where the crops had been planted. In early May 2013 another apiary showed extreme colony loss immediately after a neighbouring field had been planted with treated soybean. 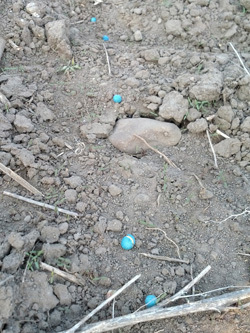 Exposed treated seed was visible (Figure 1) on the soil surface. 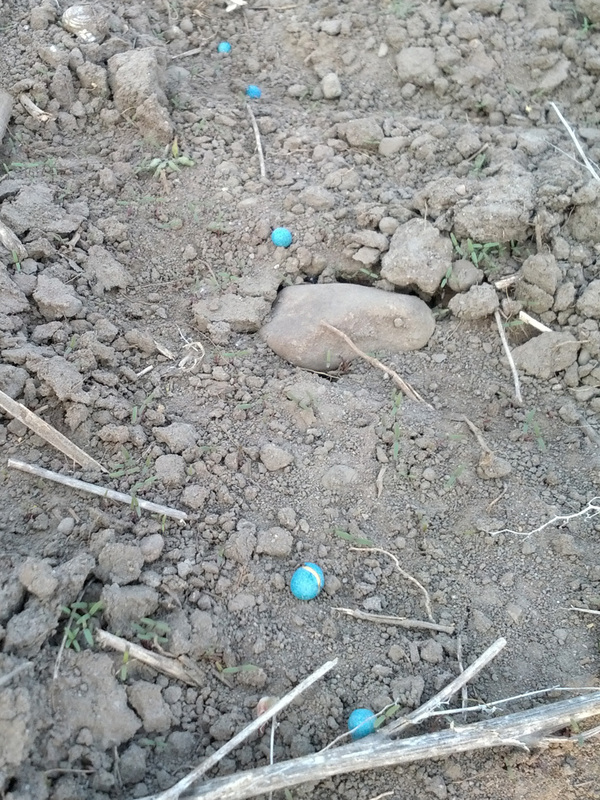 Near the edges of the field we found treated seed coats (Figure 2). The bees in the apiary displayed symptoms consistent with neonicotinoid exposure. Out of 50 colonies, 49 immediately showed signs of acute poisoning and a drastic drop in adult bee populations. Samples of the bees were again taken by PMRA personnel. We are still waiting for the test results from these samples. In 2010 it was first noticed that previously solid brood patterns became irregular and some of the larvae were twisted and dead. In the following months more and more larvae became affected (Figure 3) and the adult bee population shrank to a few hundred per colony. Despite this condition the queen continued to lay eggs (Figure 4) until the entire bee population gradually disappeared. Because neonicotinoid pesticides remain in contaminated pollen and nectar which are fed to the brood, many young larvae cannot develop and mature. As older bees succumb to the chronic poisoning and die there are no replacements. The larvae that do mature emerge into young adult bees that can be found dying and twitching at the hive entrance. Young bees found in this state at the front of hives are a sign that the colony has been compromised by neonicotinoids. Video 1. Adult bee dying and twitching at hive entrance after soy planting. Water is essential for honey bee colonies. Bees fly out from hives even in cold weather to collect water from leaves, soil and wherever they can find it. According to Hunt and Krupke (2012) “each corn seed theoretically has enough pesticide to kill well over 100,000 bees.” Rain water leaches pesticides into the soil where it can remain active for up to three years and honey bees collect water from wet soil, puddles and ditches. Bees consume the water and if the exposure does not cause acute death, the bees bring the water home to poison their colonies resulting in chronic poisoning. Annual applications of neonicotinoids compound the problem. 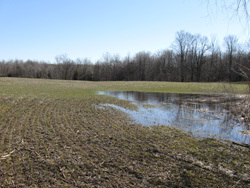 Figure 5 shows water standing in a treated corn field that bees use for water foraging. In early spring bees are desperate to collect pollen. They try to collect dust from bird feeders, sawdust, and white powder from poplar tree trunks. A few exposed corn seeds coated in toxic neonicotinoid dust are sufficient to poison entire apiaries as honey bees foraging for pollen carry it back to the colony. Since neonicotinoid pesticides are systemic and appear in all parts of a plant including roots, stems, leaves, flowers, and fruit, honey bees become exposed while gathering nectar, pollen, and water. A 25m × 10m area of grape hyacinth was planted to provide a source of pollen and nectar in early spring and in another area native star thistle was allowed to grow and bloom. Star thistle flowers all summer and grape hyacinth flowers for a month at end of April and in early May. On a sunny day in 2009, 30 foraging bumblebee queens were counted in 10 minutes on the grape hyacinth and in 2012 and 2013 none appeared. 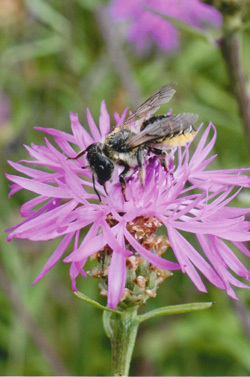 The last time the large solitary Megachile was observed visiting the star thistle was in 2008 (Figure 6). The sudden death of foraging bees, the subsequent slow decline and disappearance of colony populations and increase in winter losses coincided with the planting of treated corn 150 m from the bee yard. “This chemical has properties and characteristics associated with chemicals detected in ground water. The use of this chemical in areas where soils are permeable, particularly where the water table is shallow, may result in ground water contamination. This compound is toxic to birds and mammals. Treated clothianidin seeds exposed on soil surface may be hazardous to birds and mammals. Cover or collect clothianidin seeds spilled during loading. Neonicotinoid pesticides should not be used as a pest control measure. Integrated Pest Management practices must be promoted. It should be mandatory for seed companies to make untreated seeds available to farmers. Neonicotinoids kill beneficial organisms from pollinators to earthworms to predatory insects. Neonicotinoids should be avoided entirely. Spring is a peak water foraging time for honey bees that coincides with seeding time. Spring runoff mixing with neonicotinoid tainted seeds has catastrophic effects on bee populations. The European Commission’s decision to ban Imidacloprid, Thiamethoxam and Clothianidin should be followed as a first step to protecting our pollinators and ecosystems from this class of chemicals. Beekeepers cannot continue to absorb the heavy financial loses of their honey bee colonies because of neonicotinoid poisonings and many will be forced out of business. This will affect not only the products of bees such as honey, pollen, propolis and wax, but also fruit, nut, vegetables, oilseeds, etc that make up the pollinator’s $2 billion annual contribution to Canada’s economy (Canadian Honey Council). Figure 1. 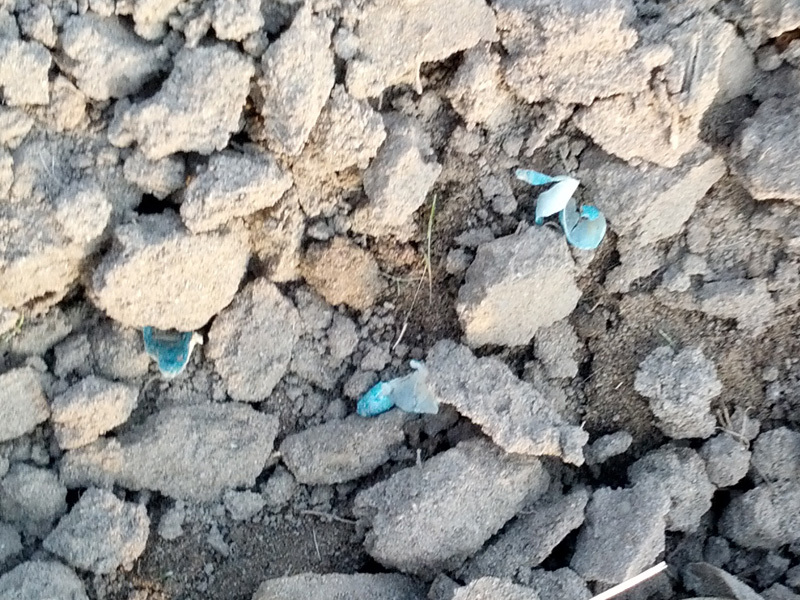 Bright blue treated soybean seeds exposed on the soil surface after planting. 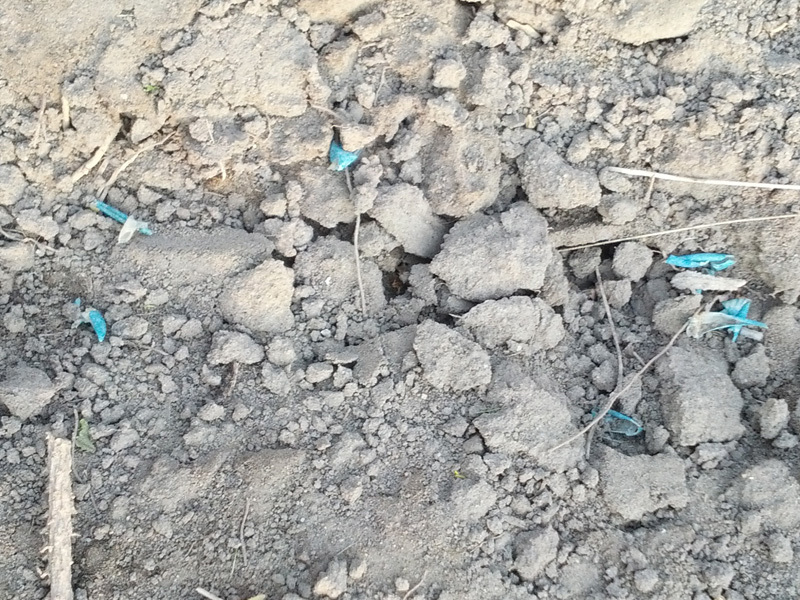 Within 2 days of the field being planted, 98% of colonies in an adjacent beeyard died. Figure 2. 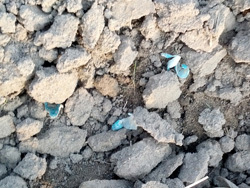 Insecticide treated soybean coatings observed near the edge of a field. These can be blown by the wind to poison areas beyond the field. Figure 3. 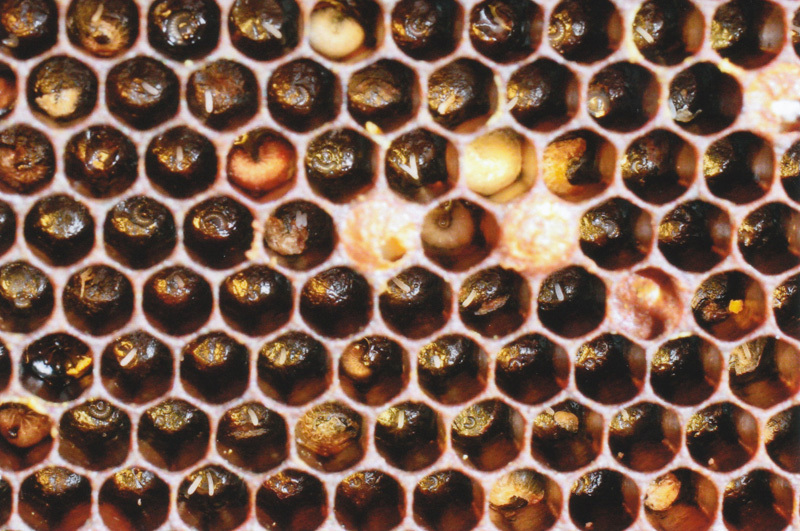 The brood pattern of a honeybee colony displaying the symptoms of low concentration (sub-lethal) neonicotinoid pesticide poisoning, consistent with colony collapse disorder (CCD). Figure 4. Days before the collapse of the honey bee colony, the queen was still laying eggs, however the brood failed to develop. Figure 5. Water standing in treated corn field is consumed and taken back to the hive by foraging bees. Figure 6. The large solitary leaf cutter bee (Megachile spp.) has not been seen foraging on star thistle since 2008. Hunt G. J.; Krupke C. H. (2012): Neonicotinoid seed treatment and honey bee health. American Bee Journal 152|(9): 889-891. Mason, R.; Tennekes, H.; Sánchez-Bayo, F.; Jepsen, P.U. (2012): Immunesuppression by neonicotinoid insecticides at the root of global wildlife declines. Journal of Environmental Immuniology and Toxicity, October 2012. Yamada, T.; Yamada, K.; Wada, N. (2012): Influence of dinotefuran and cothianidin on a bee colony. Jpn. J. Clin. Ecol. Vol. 21 No. 1 2012: 10-23. Szabo, T.I. 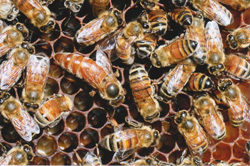 (1993): Selective breeding of honey bees for resistance to Varroa jacobsoni. American Bee Journal 133: 868. Szabo, T.I. (1994): Rate of infestation of Varroa lacobsoni in honey bee colonies in southern Ontario. American Bee Journal 134: 837-878. Szabo, T.I. (1995): Selective breeding of honey bees for resistance to Varroa jacobsoni in Ontario. American Bee Journal 135: 831. Szabo, T. I. (1998): Progress report on selective breeding of honey bees for resistance to parasitic mites. American Bee Journal 138(6): 464-466. Szabo, T.I. 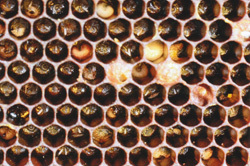 (1999): Selective breeding of honey bee colonies for resistance toVarroa jacobsoni and the effects of management techniques on Varroa infestation levels. American Bee Journal 139(7): 537-540. Szabo, T. I. and Szabo, D.C. (2000): Attempts to reduce the Varroa jacobsonipopulation in honey bee colonies: Research report for 1999. American Bee Journal 140(8): 654-658. Szabo, T.I. and Szabo, D.C. (2001): Varroa jacobsoni infestation levels of honey bee colonies in the fourth year of a breeding program: Report for 2000.American Bee Journal 141(6): 437-440. Szabo, T.I. and Szabo, D.C. (2002): Varroa infestation levels of honey bee colonies in the fifth year of a breeding program: Report for 2001. American Bee Journal 142(6): 423-427. Szabo, T.I. ; Szabo, D.C. (2003): Varroa infestation levels and honey bee colony characteristics in the final year of a breeding program. American Bee Journal 143(10): 798-802.